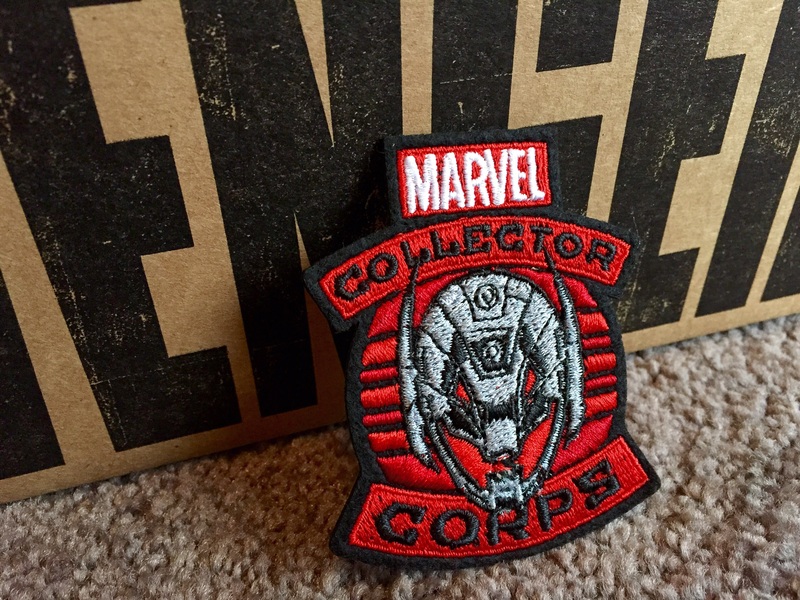 Marvel Collector Corps: Is It Worth It? 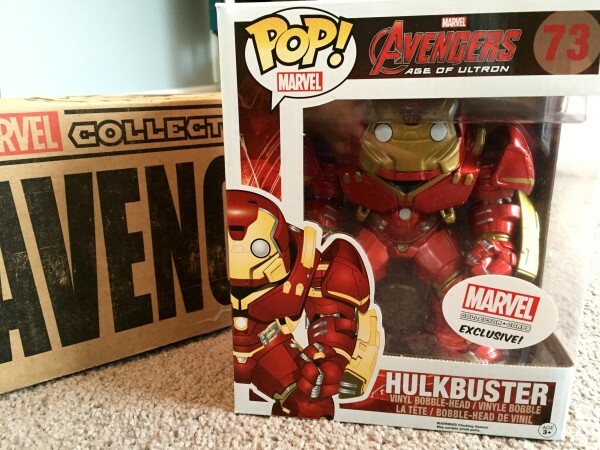 Marvel Collector Corps is a subscription box service designed by Marvel and Funko. Created for the Marvel Collector, each box delivers 100% exclusive premium collectibles, apparel, and accessories direct from the Marvel Universe to your doorstep. Each box is built around a major Marvel event. Marvel Collector Corps celebrates the dedicated Marvel fan and intends to create a new Marvel Collector elite! Unlike LootCrate (which we previously reviewed), this box comes once every other month, which makes it a little easier to stomach the $32 coming out of my bank account. 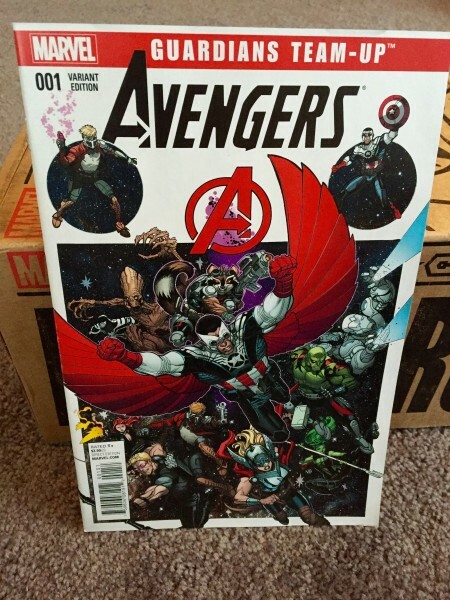 As you can see in the photo above, this particular box focuses on the release of Avengers: Age of Ultron, while the next one will center on the release of Ant-Man. Below you will find a picture of each item exactly how they arrived, along with estimated pricing for each piece. Please note: all of these items are exclusives so exact pricing is tough to come by. When you first crack open the box you are greeted by Steve Rogers, aka Captain America, in this nifty little collector pin and the villainous patch below. 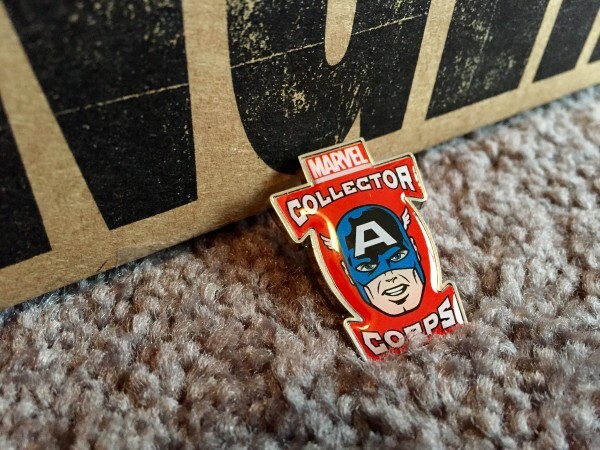 The only place you can find this particular pin is either in Collector Corps box OR by searching Ebay by the people who immediately sell the innards of subscription boxes. Similar pins range anywhere between $1.75 and $5.97, so I will split the difference and say this is probably worth around $3.25. The other item sitting on the top of everything else was this nifty Collector Corps embroidered patch. Like everything else in this box it was a little difficult to find an exact price on this guy. According to Amazon a majority of these patches range anywhere from $4.50 to $7.99. Since this patch is on the nicer side I would guess its worth at around $6.99. This. Thing. Is. Huge. The kid in me wants to rip open the box and play with it while the Lord Business side of me wants to cherish it, but keep it sealed so it retains it’s value… not sure which side I will end up on as of this writing. Most Funkos are around 3 3/4 inches tall, but not the Hulkbuster. This thing is 6 inches tall, and it’s a real 6 inches, not whatever Subway is pushing these days (they could very well be 6″ please don’t sue, Subway). Price wise, these are currently going for over $40 on ebay right now, so there’s that. 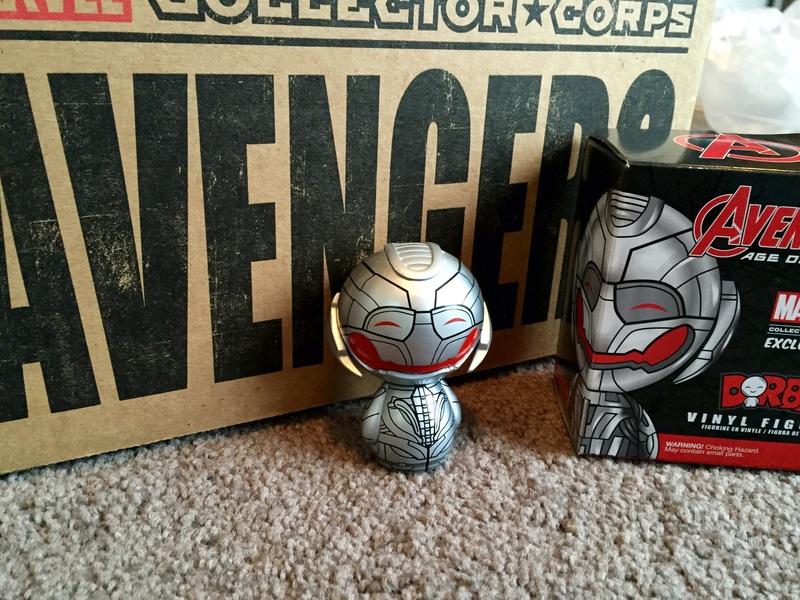 This little Ultron is pretty neat and will eventually make its way to my nerd-shrine at work. I am not sure if everyone gets Ultron or if it’s a random figure in each box, but I saw them at Target yesterday for $5.99. Like the Guardians and want to see them team up with the Avengers? Well good news, this is your chance (sort of). If you have been following the Marvel Comic Universe you know that the guy we know as Thor no longer wields Mjolnir, and a lady who has yet to be named at the time of this writing is the new Thor. Also Falcon is Captain America, and Iron Man is a jerk, which I know is par for the course… MORE of a jerk. That being said here is a variant cover for the Guardians/Avengers Team Up comic. The pricing of this variant issue seems to be hovering right around cover price at this time so $3.99. This is by far my favorite item included in the box. It has a great design and feels tremendous. I made sure to wear it when I went to see Avengers: Age of Ultron. Overall there are four separate styles for this shirt. Personally, I was pretty excited that I got Cap on mine. 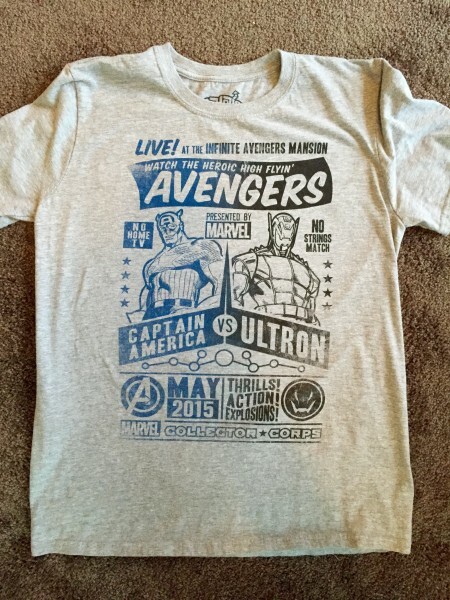 Other shirt styles have Iron Man, Hulk, or Thor on them. Conservatively, these seem to be going for about $15.99 on ebay right now, which is about what you’d pay for a shirt like this in most stores. So is being a member of the Collector Corps worth it? If you total up everything this box came with using pricing from comparable items OR by seeing what these items are currently going for on the market you end up right over $70. If you remember I paid just over $30 after tax, so it is definitely worth it financially speaking. Outside of that the items are all pretty neat. The Hulkbuster and t-shirt alone are worth the price of the box. That being said, they did kind of tip their hand too early. Next time it would be nice to have them not show a majority of the merch that you’re paying for before you buy. That works at Wal-Mart, but that’s not why most people buy subscription boxes. Not knowing is a most of the fun. 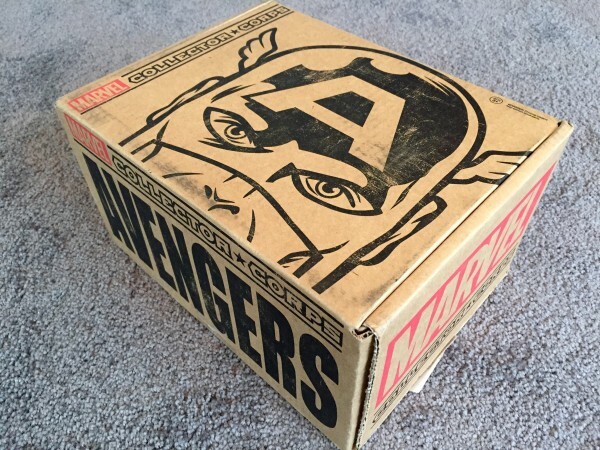 Final thought: if you are a big Marvel fan and like the whole subscription box concept then this is the box for you.